Description : South Beach Digital specializes in digital photography, particularly for businesses needing pictures for ecommerce web sites, and for real estate companies needing pictures for home and condominium web sites. South Beach Digital has provided thousands of pictures for web sites in businesses in many different industries. Prices are quite reasonable, starting at $10 per finished picture. This includes going to a (local) location of your choice, taking the pictures, and resizing them to your specifications. 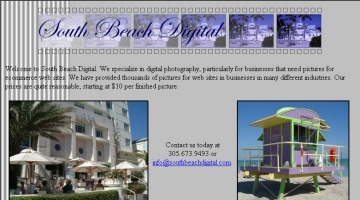 South Beach Digital can also scan photos taken by you or another photographer. If you have an existing web site, South Beach Digital can even work with your webmaster if appropriate to upload the photos directly into your site. For more information, visit www.southbeachdigital.com.